To numerous generations, Laurel and Hardy need no introduction. They may or may not have been Hollywood's first comedic duo, but they are certainly the most iconic -- with all due respect to Abbott and Costello. 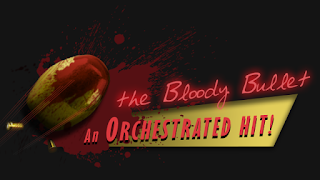 To this day, their works remain beloved and timelessly hilarious. Their most famous short film, The Music Box, was released in 1932 to laughs and adoration as well as the first ever Academy Award for Best Live Action Short. It remains one of the best examples of slapstick ever committed to celluloid, and could be studied on its own as a masterclass of physical comedy. 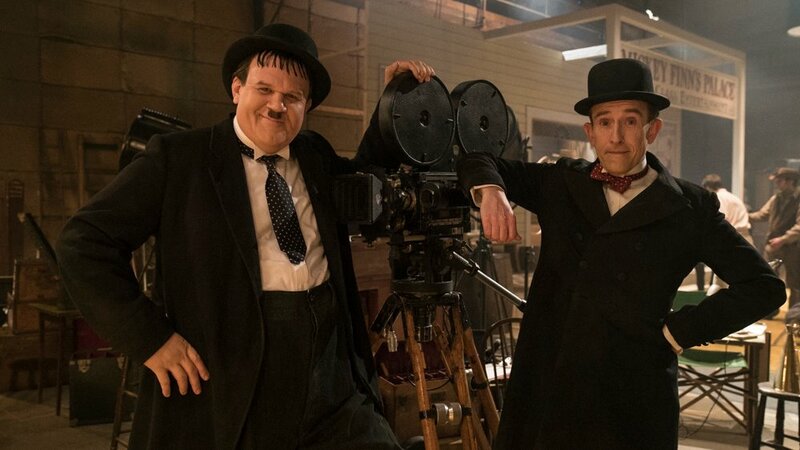 Needless to say, a biopic about Stan Laurel and Oliver Hardy was inevitable. Hell, Charlie Chaplin got his back in 1992, which featured an early Oscar-nominated performance by Robert Downey, Jr. as the titular character. Will this new film starring Steve Coogan and John C. Reilly as the original dynamic duo be worthy of their legacy? As I sat in the audience of Stan & Ollie, there was one word which kept coming to mind over and over again as I relished the impeccable craftsmanship and performances: Wonderful. This movie simply is wonderful from beginning to end. The audience in attendance was quietly absorbed into the drama, uproarious with laughter in appreciation of the classic routines, and grinning from ear to ear as they walked out to the lobby. The movie opens in the 1930s with an exemplary two-shot of the eponymous icons engaged in conversation, each reflected in one another's vanity mirror. Then when it's time to go to the set, the camera moves into a tracking shot that follows the pair through winding hallways, outside into a frenzied studio backlot, into another building, and eventually settles on to the set of a Western many connoisseurs will recognize with a knowing smile. We learn very quickly that these two men on top of the world have nowhere to go but down. Oliver Hardy (John C. Reilly under a mountain of prosthetic makeup) is in the middle of yet another divorce, but is already engaged to another woman. Stan Laurel (Steve Coogan, perfect) vows to never get married again. "I'll just find a woman I really don't like and buy her a house," he jests as he offers soft congratulations to his partner. Divorce is not his problem, but his contract to Hal Roach is about to lapse, and the surly producer (Danny Huston) doesn't seem too open-minded about giving Stan a raise. This is where the downfall of the pair begins. We jump ahead into the 1950s, where Laurel and Hardy decide to reunite for a tour of live shows all over Europe, with the hopes of reigniting their stalled careers under the auspices of a film financier with a funny name Ollie can never seem to get right. Eventually the pair are joined by their wives, and to quote one of the film's memorable supporting characters: "It's like we get two double-acts for the price of one." Opposite Coogan and Reilly, it's hard for anyone else on the screen to even attract attention, but Shirley Henderson as Lucille Hardy and Nina Arianda as Ida Laurel are worthy of their own story. Put the four of them together, and you have some of the movie's best moments -- both comedic and tender. Director Jon S. Baird passionately crafts this story for us over the film's 97 minutes, aided in no small part from a terrifically well-written screenplay by Jeff Pope. I'm sure they've taken some liberties with the history here -- what biopic doesn't? -- but it never gets in the way of the sheer enjoyment. Together they have created a gorgeous period piece built on nuanced performances and organic dialogue that never comes off stagy or schmaltzy. Layer that achievement with lovely cinematography by Laurie Rose and top it off with a melodic score by the gifted Rolfe Kent, and you have a late Christmas present which should have easily made the Movie Sleuth's Top 10 List of the 2018. How the flawless performances of Steve Coogan and John C. Reilly could have been overlooked by the Academy is truly a mystery. Some fans have speculated that it has a lot to do with another period comedy starring Mr. Reilly, also featuring a classic pair of characters, that fell flat on its face to the tune of an historic 0% rating on Rotten Tomatoes. If that is indeed the case, shame on them. In 2010, Sandra Bullock pulled off a Best Actress win for The Blind Side as well as Worst Actress at the Razzies for All About Steve. Holmes and Watson may be bad, but it's not as bad as All About Steve. And while Reilly's performance in the former will be quickly forgotten, his work as Oliver Hardy will not be. 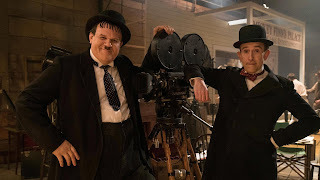 Stan and Ollie not only features two of the best performances by any actors in 2018, it's also one of 2018's best films. See it as soon as you possibly can.